In a large soup pot warm the olive oil over medium heat. Stir in the turkey and onion along with a good pinch of salt and a couple grinds of pepper and cook, breaking apart with a wooden spoon, until the meat is no longer pink. Drain and return the meat to the pan. Stir in the garlic, cinnamon, coriander, cumin, and parpika and cook until fragrant. Stir in the minced chipotle pepper plus sauce, tomatoes, and water. Stir in the sweet potatoes and let it come to a boil. Reduce heat to a low boil, cover, and cook, stirring frequently, until the sweet potatoes are fork tender. Stir in the black beans and apple. Check for seasoning and adjust as needed. Continue to cook until heated through then stir in the cider vinegar and cilantro. Serve immediately topped with extra apple and cilantro and any other toppings of your choice (highly recommend a sharp cheddar which goes so well with apple). *This will make a mild chili (I'm feeding two toddlers). If I were making it for just my husband and I, I'd probably add a bit more -- adjust the chipotle peppers/sauce to your preferred heat level. You can always add more later if you desire more kick. 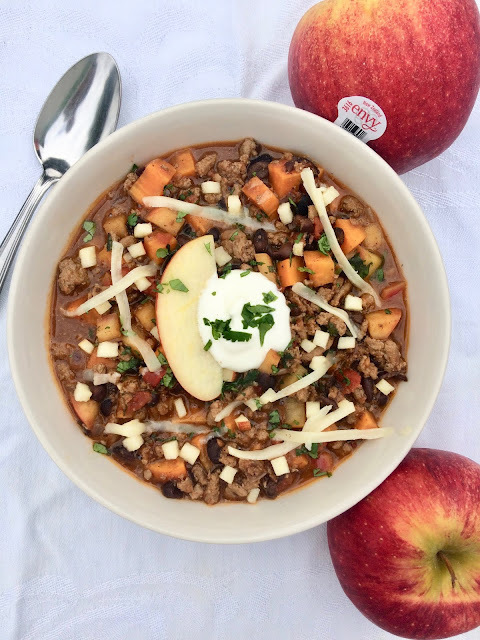 Adding apple in chili is new to me, but I love how it turned out...delicious and so flavourful! Love chili. LOVE it! Make it often, and often with all the ingredients in your recipe. Except one -- apples! Never even thought to add them. But I will -- this looks sensational. Thanks! 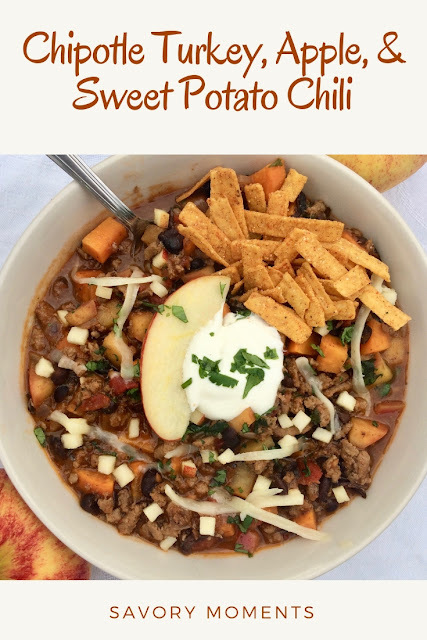 Love the smoky and sweet flavors going on in this chili. Looks delicious! What an interesting flavor profile. I will bet the depth of flavors in this dish was astounding. This makes me want to make a big ol' pot of chili today!!! Thanks for sharing on Friday Frenzy! I can't wait to make this! Thank you for sharing at our apple celebration of Celebrate 365 Blog Party! 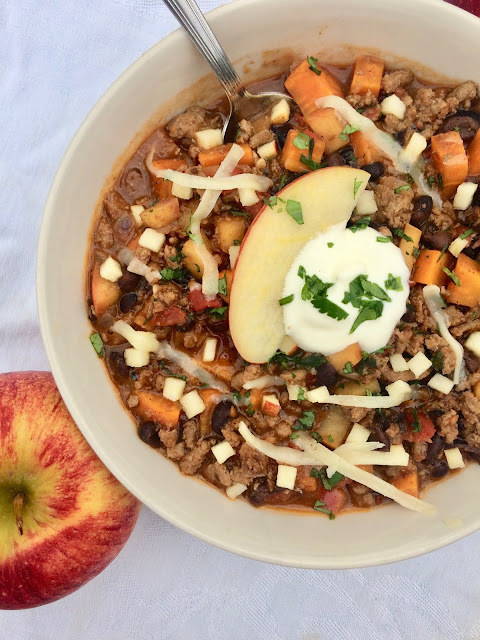 Love your use of apples in this chili! Pinned! What an intriguing combination. I love it. Thanks so much for sharing at First Monday Favorites. What a creative recipe for chili! Can't wait to try it.